The first 100 days of the Bolsonaro administration have been marked by political paralysis, in large part due to the successive crises generated by the President’s own inner circle, if not by himself. Amidst the political noise, Vice President Hamilton Mourão has emerged as a voice of reason and moderation, capable of providing direction in domestic and foreign affairs alike. Vice President Mourão has taken over management of the crisis in Venezuela and has been increasingly sought after by officials from China, Europe, and the Middle East, as well as the business community, to act as an interlocutor for the government. The former four-star general has also become a favorite of Brazilian journalists—who are frequently critical of the new administration—for his willingness to engage with the media and for his important remarks on the need for government to value a diversity of opinions. 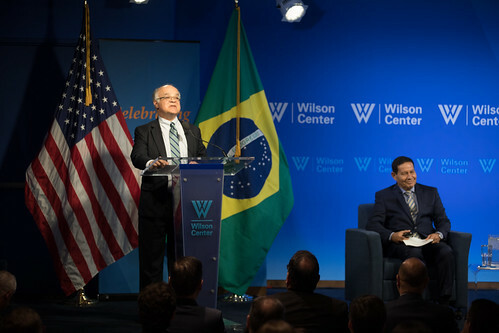 The Brazil Institute was honored to welcome Vice President Mourão at the Wilson Center on April 9, for a conversation on the political outlook for Brazil in the coming year and beyond.